Begonias have been around for ages, and with good reason. This easy to grow annual does well in a variety of conditions and needs little to thrive. Provide it with light shade, rich well-drained soil, ample water, and plenty of fertilize, and you’ll be rewarded with stunning flowers and foliage. With so many different shapes, sizes, and colors, Begonias have no problem taking the spotlight in any garden setting. Wax Begonia, the more popular variety of Begonia, can be found in sizes to fit just about any space (from as small as 6 inches (15 cm) to nearly 3 feet (90 cm) tall). The larger varieties are ideal for landscaping, and when planted en masse create a dramatic effect. Smaller Begonia varieties are well suited for container gardens, and they won’t crowd out your other plants. Flower shapes are just as diverse as Begonia plant sizes. Some plants showcase single flowers with just one row of petals, while others have double blooms with numerous rows of petals. In the past, Begonia color choices were generally limited to green or bronze foliage with white, pink, or red flowers. But today, Begonia colors are much more diverse. In the Wax Family alone, you’ll find multiple shades in the white to red spectrum. And in the Begonia boliviensis family, there are even more options, including warm yellows, reds, oranges, whites, and pinks. Begonias are rather versatile in their requirements. Old fashioned Wax Begonias are great in the shade, but several newer Wax Begonia varieties are perfectly happy in full shade to full sun. 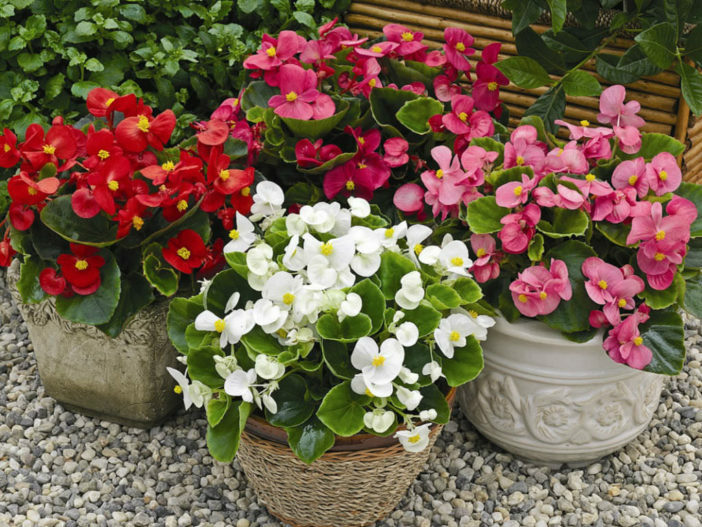 No matter where you plant Begonias, it’s a good idea to give plants a regular dose of fertilizer to help fuel the constant barrage of blooms they’re bound to throw at you. When it comes to watering finding a good balance is key for healthy plants. Most Begonias need to be consistently watered but shouldn’t get too wet (too much water can kill them). So, don’t be afraid to let the plants dry out a little between each watering. Begonia boliviensis varieties particularly like sharp drainage, as they’re native to growing on cliff walls. Most Begonias grow upright. For containers or hanging baskets, look for Begonia boliviensis and Angel Wing types, which have a more cascading habit. Begonias perform best in warm environments, so planting after there’s no longer a chance of spring frost will help your Begonia thrive. Be patient after planting. Begonias take a bit of time to get going, and you usually won’t see a burst in growth until after the summer heat kicks in. This plant helps tend to itself by practicing “self-cleaning”, meaning there’s no need to remove or “deadhead” old blooms from the plants throughout the growing season. Begonia propagation is easier than you think. There are several Begonia varieties, and they all have the same propagation process. To propagate from stem cuttings, trim Begonia stems 4 inches (10 cm) and insert directly into a growing medium so Begonia can root properly. Water and provide proper light. To propagate Begonia from seed, you’ll start with seeds, seed-starting pots, and seed-starting mix. Fill pots with seed-starting mix and lightly mist with a spray bottle. Gently place seeds in pots and loosely cover with plastic wrap to maintain humidity and warmth. Let your seedlings grow in a warm spot out of direct sunlight.